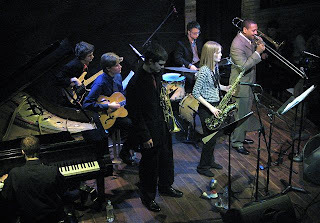 12/1/07, The Dakota: Co-sponsored by the Dakota Foundation for Jazz Education and the MacPhail Center for Music, the Dakota Combo is a group of high-school student musicians who are selected by audition to study with jazz trumpeter and educator Kelly Rossum. Previous Combo members have gone on to the Brubeck Institute, Berklee, Oberlin, and Indiana University. This year's edition features Jake Baldwin on trumpet, Stephanie Wieseler on tenor sax, Geoff LaCrone on guitar, Jacob Wittenberg on piano, Corey Grindberg on bass, and Matthew Roberts on drums. 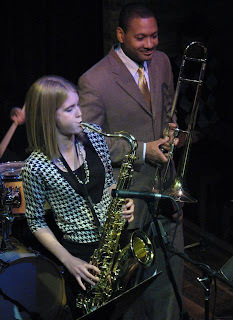 Last year's combo performed with guest artist Bobby Watson; this year's rehearsed and performed with Delfeayo Marsalis, the trombone-playing Marsalis. Delfeayo is spending a lot of time in Minneapolis these days. In January he came to the Dakota, in June to Orchestra Hall with his brother Branford, and in August he returned to Orchestra Hall with James Moody. While in town for his June date at Orchestra Hall, he also made a surprise appearance at the Dakota, sitting in on the Trombone Summit show with Steve Turre, Wycliffe Gordon, and Fred Wesley. Four trombones on one stage: That was an amazing night. Playing music by Wayne Shorter, Lee Morgan, Miles Davis, Jerome Kern, and original compositions by the students themselves, the Combo more than held their own with Delfeayo and before a club crowded with parents, supporters, and people who didn't know the Combo but came to see Delfeayo. Andrea Canter wrote a terrific blog entry and that's what you should read if you want to know more. I'll also post the link to her review on Jazz Police when it's live. Photos: The Combo with Delfeayo; Delfeayo digs Stephanie's solo.